When lawn mowing your lawn should be cut to a minimum height of 3” depending on the type of grass you have. More frequent lawn mowing will be needed between the months June and October when we are in rainy season and the grass is growing 4″ – 8″ per week, never removing more than 1/3 of the grass blade in one cutting. 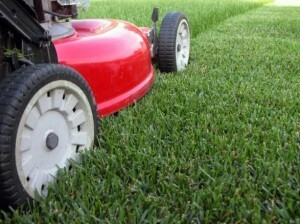 Removing too much of the blade length at one time puts stress on the grass and weakens your lawn. A longer cutting height results in a stronger, deeper root system and provides shading to the soil which helps retain moisture and prevents weed seeds from germinating. 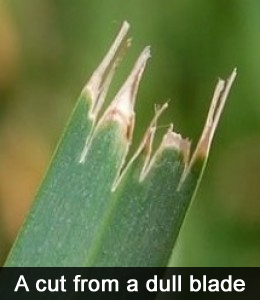 For a better experience with lawn mowing the lawn mower blades should be kept razor sharp. The reason for this is a sharp blade makes a clean and precise cut which seals very quickly and helps the lawn to resist diseases. A crisp cut is much easier to achieve on a dry lawn rather than a wet or moist lawn. To maintain a razor sharp blade, it may be necessary to have the blade sharpened multiple times each year (I sharpen the blades on my tractors every weekend and if there are any large nicks in them I replace them immediately). A sharp blade also reduces wear and tear on the lawn mower engine and will increase the mowers efficiency thus helping the fuel to go further because the lawn mower doesn’t have to work so hard. Ideally the cutting pattern should be altered during each lawn mowing because this will help to keep the grass blades growing straighter and stronger. While lawn mowing, the grass clippings should be left on the lawn and not bagged. This is a natural and environmentally friendly practice. The reason for this is grass clippings are about ninety percent water weight. They are also very high in protein and should be left on the lawn to decompose and add nutrients to the soil. That is why Miracle Lawn Care uses mulching type lawn mower blades. This is ideal for grass‑cycling as it cuts the clippings smaller and allows for a much quicker decomposition. Grass‑cycling also reduces waste which conserves landfill space. The only time the clippings should be removed is when they are too long and will end up smothering the lawn.